Welcome to this week's edition of Craftoholics! No idea what the what I'm talking about? Go here to find out more! This week's Craftoholic is the super duper Sarah from Australia! Please list any crafts you enjoy making. What is your favorite? "I love to scrapbook – it would have to be my all time favourite craft – it’s always changing and evolving so I never get bored! I also love to create anything I can out of paper, create 3D photos, quilt, sew, alter and invent." When did you start making crafts? Was there a particular reason or event that got your started? "I probably started in Kindy, I think I have always loved crafty things, I actually began scrapping before I even knew it was scrapping! I just loved to arrange photos and add die-cuts, journaling and other bits and pieces. I’m either sentimental or a hoarder – I keep everything from every occasion! The first thing I scrapped was my honeymoon photos, then my first daughter was born and scrapbook magazines became available and my techniques and ideas have evolved from there." What do you like to do when you aren't crafting? "Think about crafting? My mind never stops – no actually I spend time with my girls – generally creating photos that I can then scrap!" Cutie Pie indeed! And I am so in love with that tree! What makes you a craftoholic? What drives you to create? "The fact that everything I see – I believe has potential to be something else – with ribbons, stickers and some doodling! I see patterns and pictures in clothes and want to re-create them or find them printed on paper, I have to really look at things – inside and out to see how they’re made, I can sniff out a scrapbook shop at 500 yards. I create to make people smile, so see their faces when I’ve made something just for them – especially when they’re not expecting it, I scrap so that my memories never fade, and the next generations of my family know who we were and what we did." "My favourite food would have to be cupcakes, followed closely by anything made from pineapple!" What food do you hate to eat? "I cannot eat fish, pork or mushroom – the smell while they are cooking is enough for me to pass out!" 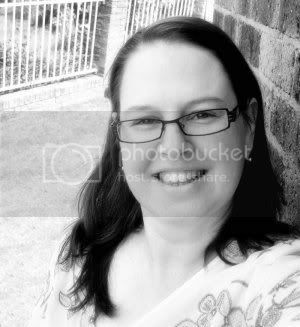 "I have been blogging since July 2007 – I started because I have so many friends and family abroad, and blogging seemed like a great way to keep in touch with them all! It has just snowballed from there and I have met so many wonderful and talented people! I never dreamed that I would become addicted to it though!!" "That I have an instant connection to all of my online friends, that I can see updates on their blogs and leave virtual hugs and love through comments. I also love the support and love that I have been left!" 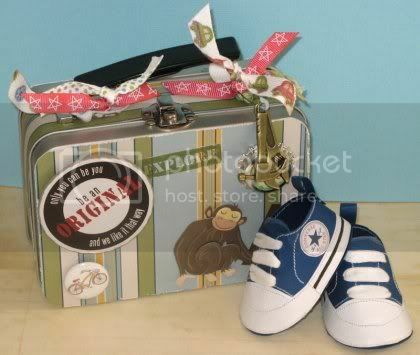 What an adorable altered box! What craft have you always wanted to try but, for whatever reason, never have? "Iris folding – it looks beautiful with all the different levels and colours of paper!! I don’t know why I haven’t tried it, just needed a reason I guess!" "I’d just need a crop-o-dile, they seem to be able to do everything and anything, a quilting needle and a huge spool of thread – you’re going to need something to weave and sew all those palm leaves together to make a roof for your hut, and a crop-o-dile will cut through some wood so you can tether it together, and you might even have some left over leaves for curtains – they’ll be cut with the scissors into dainty scallops and hung with adhesive! Woohoo instant beach hut! Now to collect some shells for jewelery…"
Thanks for letting me interview you Sarah! You are a serious Craftoholic! Be sure to check back next Monday when another lucky victim...ahem, I mean crafter will be added to the Craftoholic family! Great interview Sarah! I love your craft space and those projects are phenomenal! Good thinking on using the scrapbook tools for something other than scrapbooking! How efficient and smart! LOL! Great post! Congrats to both of you! awww i love the baby pics!! and that cupcake is adorable!! Love to find out about other crafters and what makes them tick.. I will have to visit her blog and I want that craft room!! Love the craft room...I so need to get the scrappy schoolhouse completed. 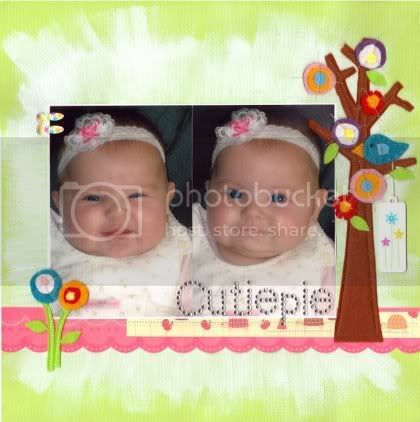 Love the Cutie Pie layout! Hi Sarah!! Awesome stuff in your interview. Your work rocks! Terrific projects and WOW what a craft space! LOVE it! Another wonderful interview! Great Designs And your scrap room is drool worthy!!!!! Aw thank you so much! Thanks Maggi for your fun interview - and yes I am a Craftoholic! what a fun interview! and that creating space is fantastic and gorgeous!! that baby layout is toooooo cute! Hey Maggi....I got that wave and thank you!!!! Next time you come this way....no waves and stay over!!!! Promise and my house is child proof so Toot would fit in just perfect and we could go shop for PINK things!!! Love ya!!!! What a crafting space! 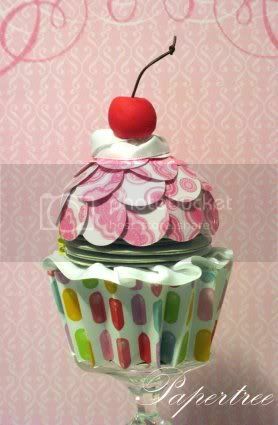 I adore the paper cupcake! Woo Hoo! You go Sarah! I love your craft room. Congratulations on the interview. Thanks so much for your lovely comment! Hope too you had a super trip to New York & are having a great week! PS am still getting visits to my Xmas in July post!! Congrats on such a popular & successful idea!!! hi.. i stumbled upon your blog and i love your scrapbook room! I really want to design my room like yours when i get married and move into my new house (which is still in about 1 year's time). could you publish more photos of the layout? i am a scrapper too but sorry to say tt i can't proclaim myself as a scrapholic... :| thanks for sharing all your wonderful crafts! Hi Joy - thanks so much for your interest in my room and layout - you can see more photos at my blog: papertree.blogspot.com - tried to visit your blog but it's not public. I always post close ups of layouts to show details. Thank you so much to everyone else for your wonderful comments!